Balint Seeber’s new software supports not only the USRP, but also a range of low-cost USB dongles designed for receiving DVB-T television signals. When I read about this, I felt that I can’t not try one, so I ordered an ezcap dongle for $20 from a Chinese seller on eBay. It arrived a couple of days ago, and my experience so far is very positive. The dongle I ordered was listed as an ezcap dongle, which is one of the models supported by Balint’s software. 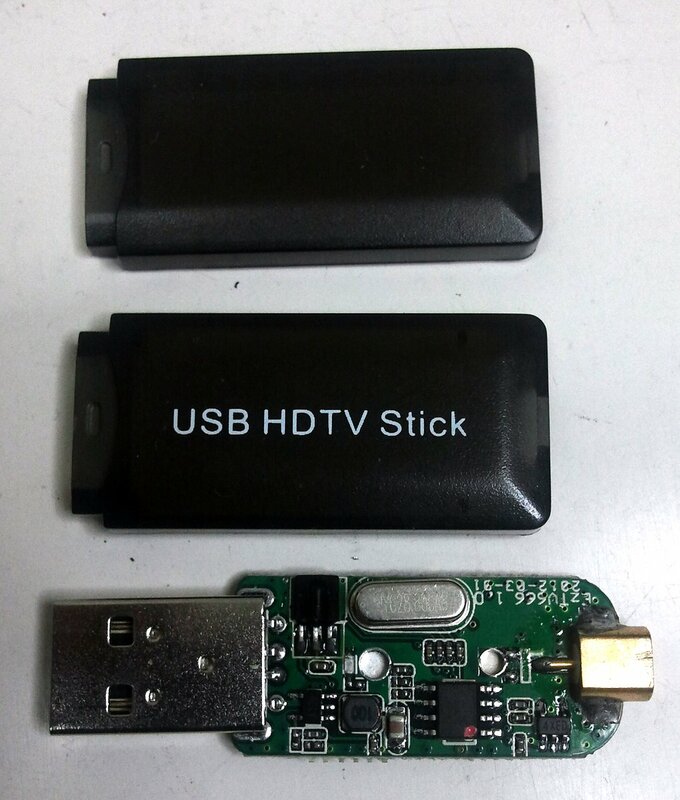 The dongle that arrived is exactly the one that was shown in the picture on eBay; inside, it was labeled as EzTV666. It came with a 15cm whip antenna, so I plugged in the antenna, plugged in the dongle, configured the driver using Zadig, and started up HDSDR. Balint’s library for the USRP and the TV dongles was already installed, so all I had to do is tell the software that I wanted to use a TV dongle and it worked without a problem. I didn’t have to install any new software. I was immediately able to receive some local narrow-band FM traffic. I ran the dongle with a bandwidth of 1.6 MHz, so you can see a nice piece of spectrum on the screen at once. It goes up to 3.2 MHz, but Balint warns that high bandwidths cause some signal degradation. In the screenshot below you can see shorts bursts from a hand-held trancseiver at the input frequency of a local repeater and the repeater’s output 600 kHz higher. The repeater output bursts are longer because the repeater controller adds a “tail” to each transmission. It’s pretty neat to see both the input and the output of a repeater at the same time. The dongle’s frequency is a bit off, so the displayed frequency is incorrect (about 10 kHz too high), but this is easy to correct in HDSDR (Options -> ExtIO Frequency Options). I installed the software that came with the dongle on another computer. Reception of local broadcast FM stations was good, but I was not able to receive DVB-T television signals, even with the bundled whip antenna outside the window. Clearly, I needed better antennas if I was to receive more interesting stuff. To use better antennas, I needed some way of connecting them to the dongle. From the picture on eBay it was not easy to determine the type of RF connector used on the dongle; it did not seem to be the IEC 169-2 connector that is used in some of the other SDR-capable DVB-T dongles, but I didn’t know what it was. When the dongle arrived, I realized that the connector is an MCX connector. I didn’t have any cables with MCX connectors or any MCX adapters, so my initial thought was to cut the cable from the rather useless whip and terminate it with a BNC, but before I did that a friend gave me an MCX-to-N patch cable that he bought at a surplus store. That was good enough to connect any of my existing antennas, so I continued the experiments. I first tried a 145 MHz dipole (1m end to end). 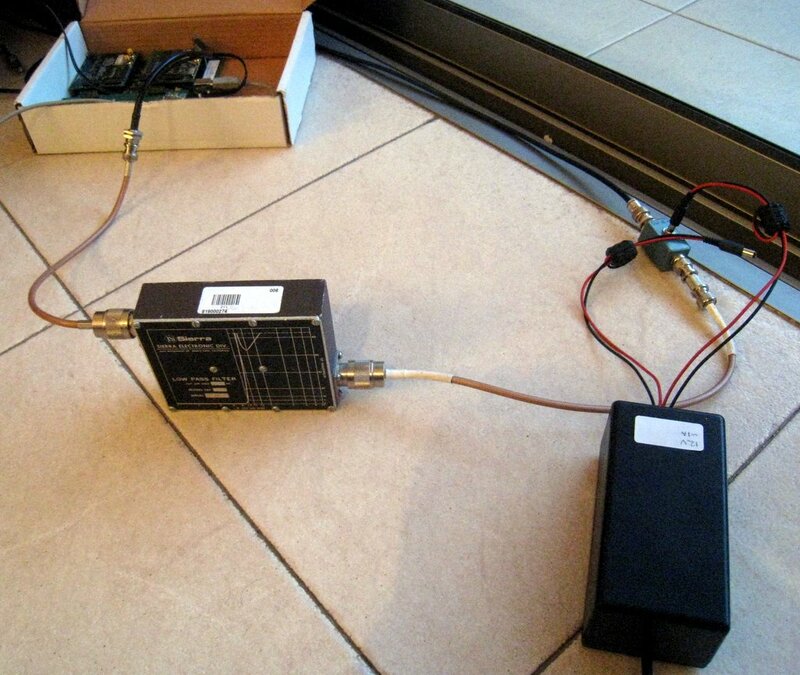 It improved the reception of local UHF and VHF narrow-band FM dramatically, and it also worked very well for DVB-T (which is at 514 MHz here); I was able to watch TV on the computer. It also worked reasonably well for air-band signals. The next stage was to try to receive satellite signals. I experimented previously with a borrowed FUNcube dongle and I new that the FUNcube was very capable of receiving satellite signals. The FUNcube dongle uses the same tuner chip as the ezcap (an Elonics E4000, but its analog-to-digital converter is higher resolution than the ezcap’s; the FUNcube also has a low-noise preamplifier ahead of the tuner, and I am not sure if the ezcap uses one (if somebody knows, let me know). A satellite called VO-52 was supposed to fly over last night, so I turned my cheap Yagi towards it and listened. Initially, I attached a preamplifier between the antenna and the dongle, but I later discovered that it did not make a huge difference. VO-52 has both a Morse beacon and a linear transponder. The beacon came through very clearly. 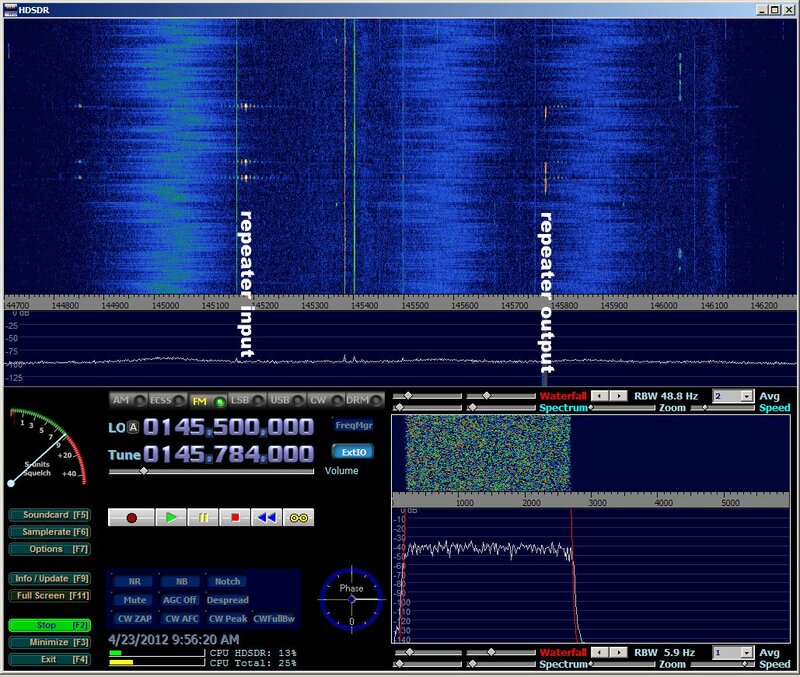 In the screenshot on the right you can see the beacon’s signal move down in the audio passband due to Doppler shift. It it well above the noise and easy to hear. 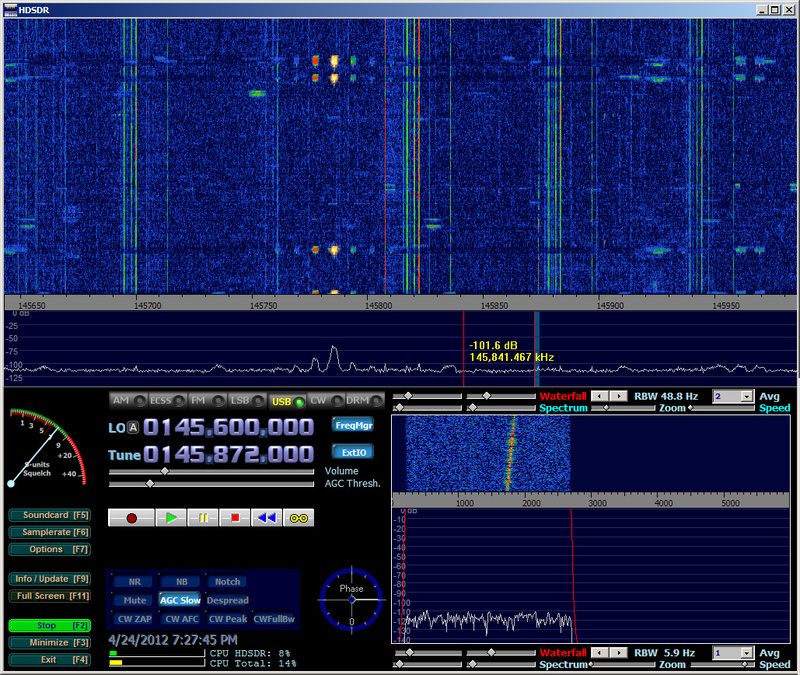 Next, I checked whether I can receive SSB signals in the transponder’s passband; I could. Here is a short recording of one Greek station (the Doppler shift causes the speaker’s voice to become lower over time). 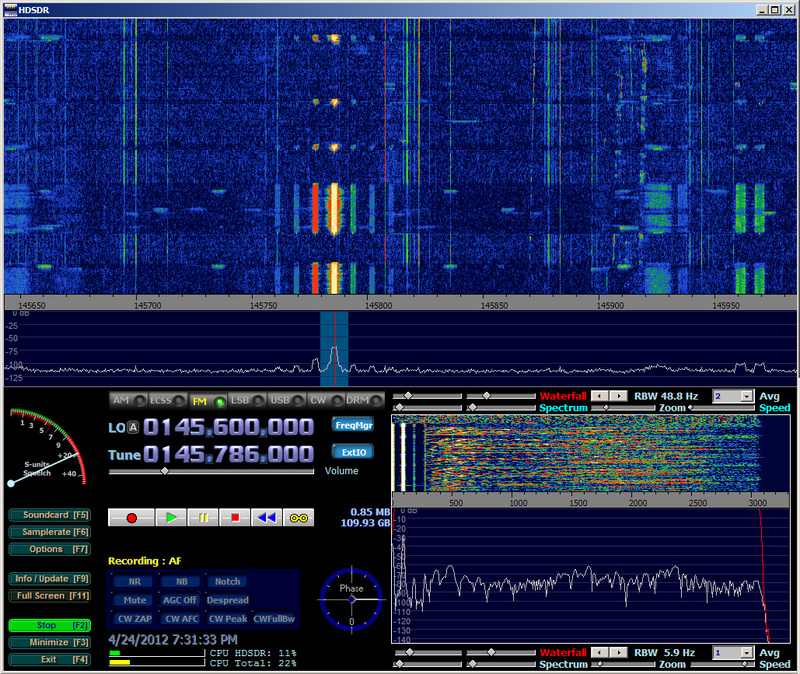 While I was listening to VO-52, the local FM repeater sprang into activity. It is only about 100kHz away from the satellite’s signal; when the repeater was transmitting, it was causing pretty severe distortion of everything else the dongle was receiving. The satellite still came though, but not as well. You can see the effect in the screenshot on the right. I discovered that this was caused by too much gain in the preamplifier+dongle chain. There are two ways to solve this: to not use a preamplifier, or to drastically lower the gain of the dongle (you can set the gain with a slider). The main benefit of the preamplifier in my setup is that it includes a good bandpass filter. Without the preamplifier, strong-out-of band signals sometimes overwhelm the dongle. With it, reception is much more consistent. But the dongle does work reasonably well even without anything between it and the antenna. Another interesting thing that you can see in the last screenshot is the strong CTCSS tone coming out of the repeater, at 91.5 Hz. It is clearly visible in both the audio spectrum display and in the audio waterfall. Balint Seeber developed a software library that links HDSDR, a software-radio receiver program (and a few other related programs) with USRPs, a family of FPGA-based radios. I have a USRP1, the original USB-based motherboard, a BasicTX and a BasicRX daughter boards (which are basically just transformers linking the input coax connectors to the amplifiers that feed the ADCs), and an RFX400 transceiver (up/down converter to 400-500Mhz). The USRP radios are best supported by GNU Radio, an open-source signal-processing toolkit. I have already used GNU Radio. The software is very capable, but it is somewhat difficult to install and it does not come with complete sophisticated radios. There are also drivers that interface USRPs to Matlab/Simulink; I was unable to get them to work. Therefore, I was delighted to learn that Seeber wrote the library that allows USRPs to be used with HDSDR and decided to give it a try. 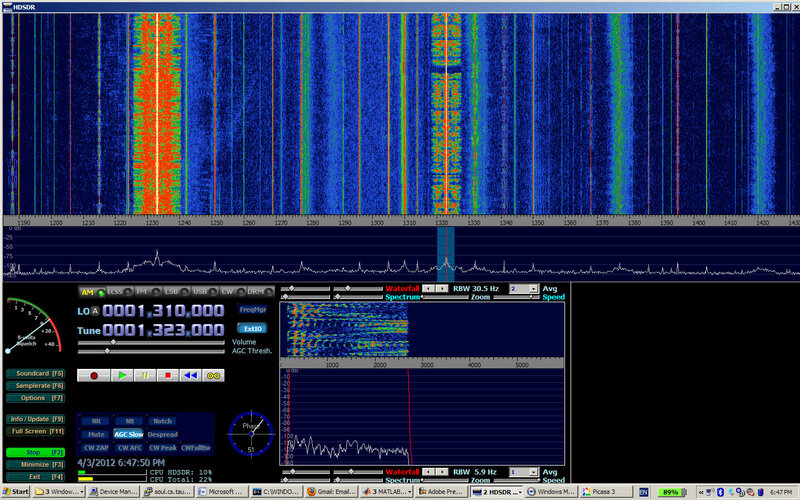 HDSDR is a radio program that was derived from earlier programs (Winrad and WinradHD). It supports a wide range of RF frontends through the use of software libraries called ExtIOs. Seeber wrote an ExtIO library that can control the USRP and can transfer RF samples from it. Downloading and installing Seeber’s ExtIO library and HDSDR was easy, thanks to an installer that Seeber wrote. Seeber’s software can also switch the USB-based USRP between two different drivers, which is a very useful (my experience in trying to switch these drivers manually has not been good). After installation, I gave the software a quick try by tuning to a UHF and checking that the RFX400 can receive a signal from a handheld transceiver; it did. I decided to try to USRP on HF next. I connected one of my amplified receiving loop antennas to a bias tee, then from there to a low-pass filter, and from it to the input of the BasicRX board. The low-pass filter is a high-quality 39 MHz surplus unit. It’s role is to eliminate aliasing of VHF signals into the HF spectrum. Ideally, the stopband should have started at 32 MHz (since the USRP samples at 64M samples/second), but a 39 MHz unit was all I had. I was not sure whether I would receive many signals, since between the BasicRX input and the input of the ADC there are only 20dB of amplification. In the picture you can see the USRP (in the background, in a cardboard box), the filter, the bias tee, and the 12V supply that feeds the bias tee. The USRP and the antenna are shown at the bottom of the post. It turned out that this is sufficient to receive a great number of interesting signals all over MF and HF. Here are some screenshots. In the first screenshot I was listening to BBC World at 1323 kHz, an AM medium-frequency station. 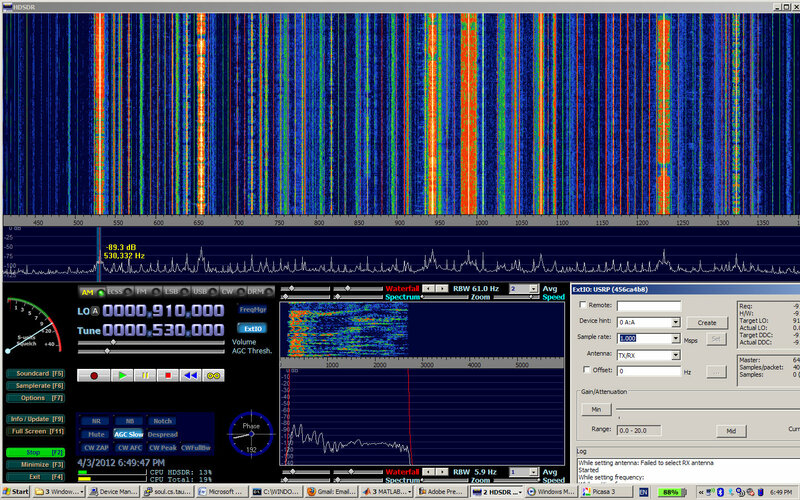 The USRP digitally down-converts the high-rate RF samples and decimates the RF samples, in this screenshot to 250k complex samples per second, so we see 250kHz of RF spectrum. In the next screenshot, the radio is tuned to a station at the low end of the AM range, but the decimation is set to a lower value. We now see a full MHz of spectrum, all of the AM range plus a bit to spare. Very neat; all the AM stations on one waterfall display. Next, we see the entire 14MHz amateur band. The band is densely populated at this early-evening hour. 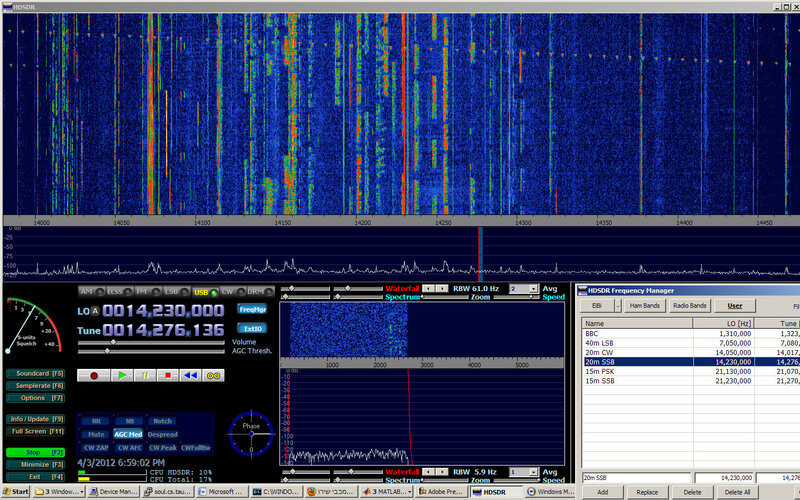 On the left we see a bunch of CW stations, PSK stations near 14070 kHz, and a large number of SSB stations starting at 14100 kHz. I was able to receive distant stations all over the HF range, all the way up to 28 MHz. Here is the antenna I used; it is mounted fairly low in an urban area. A few days later I tried UHF reception with the RFX400 daughter board. Local FM stations were received well. Satellites proved to be more of a challenge. 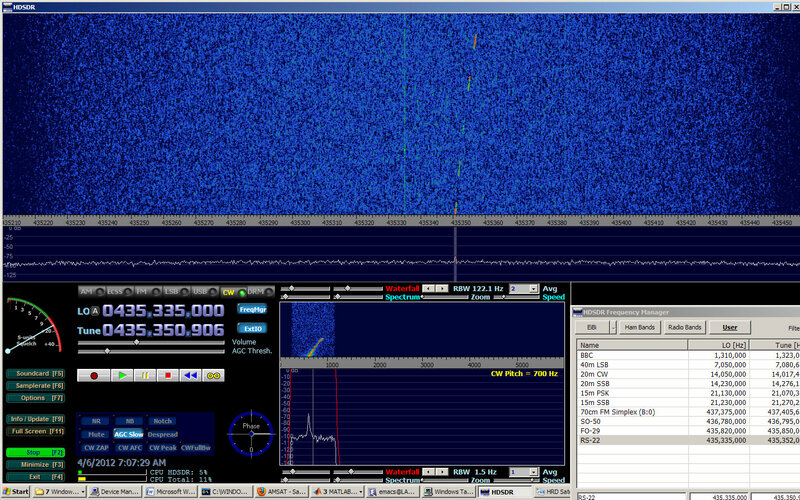 I was not initially able to receive satellites with fairly weak signals like FO-29 and CO-58 (which I can hear reasonably well with the FT-857D), but I was able to receive the CW beacon of RS-22, as you can see in the following screenshot. The Doppler shift is clearly visible both in the RF waterfall display and in the audio waterfall. You can also see the very narrow signal in the audio spectrum display. The signal was received with my small VHF/UHF Yagi. A second attempt to receive FO-29 was more successful. I was able to hear both SSB and CW signals clearly enough to understand them. Linking HDSDR to the satellite tracking program of Ham Radio Deluxe via DDE provided automatic Doppler correction, which worked out very nicely. Still, the RFX400 is probably not ideal for receiving UHF satellites. Its noise figure is not documented but I don’t think it’s particularly good, and its response rolls off below 440 MHz and above 460 MHz (as reported by Patrik Eliardsson and others). An external preamplifier would probably help. 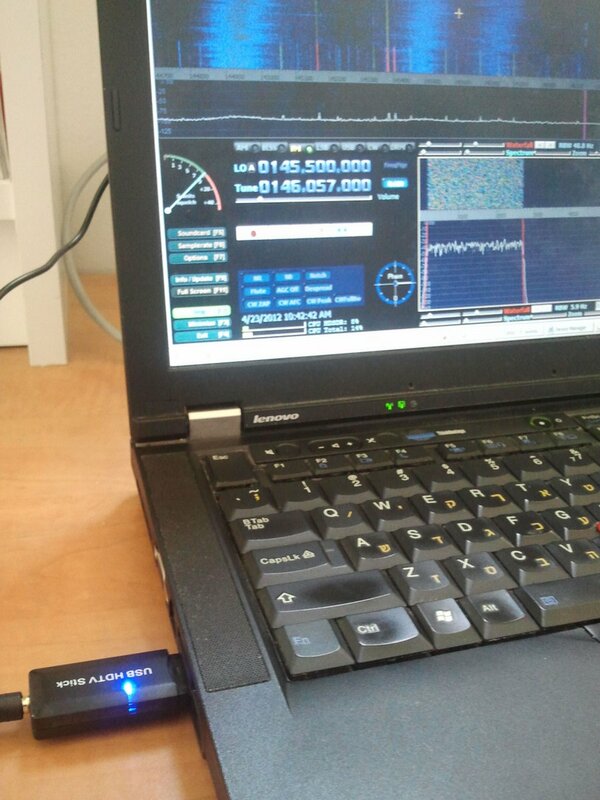 Seeber’s library also supports a low-cost USB dongle that can sample RF signals between 64 and 1700 MHz. 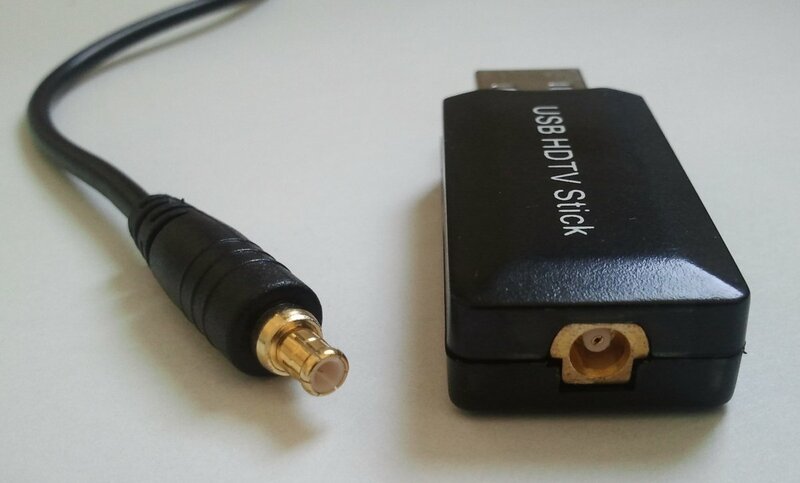 The dongle is sold as a digital-TV and radio receiver, but somebody discovered a way to cause it to send to the PC unprocessed RF samples, which can then be processed in programs like HDSDR and GNU Radio. I ordered a such dongle for about $20 from eBay and I’m looking forward to trying it out. Its analog-to-digital converter provides only 8 bits per sample, a lot less resolution than the much more expensive FUNcube dongle, but it supports much higher sampling rates than the FUNcube dongle.